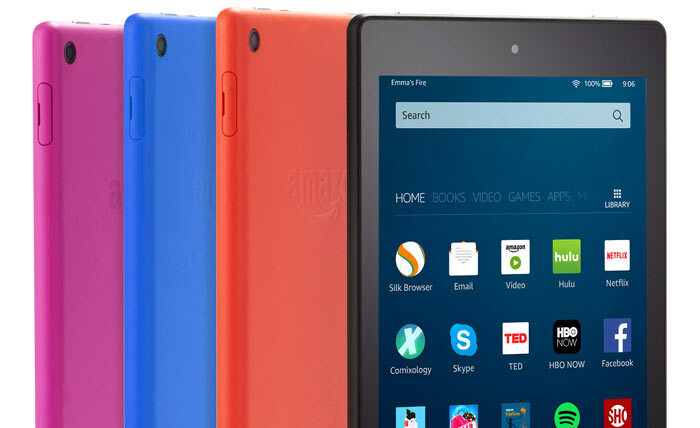 Amazon has announced an all-new Fire HD 8 tablet. Among its many improvements are; longer battery life, 50 per cent more RAM, 100 per cent more storage, faster performance, and the Alexa 'press and ask' assistant. 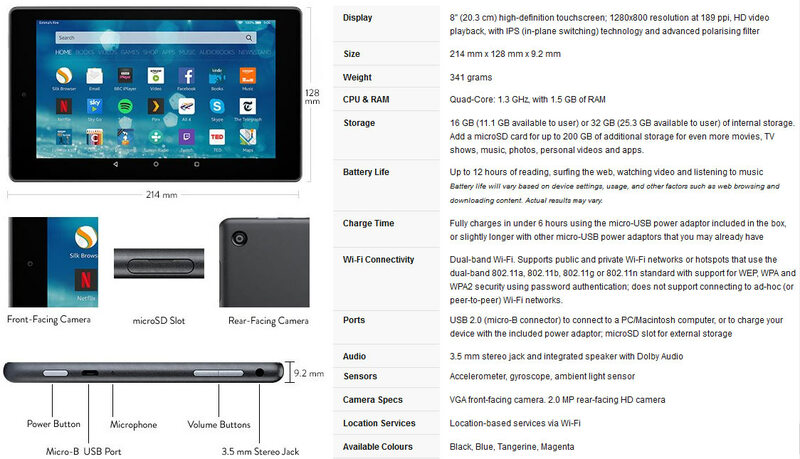 Priced from US$89.99 (£89.99 inc ads in the UK), the tablet does indeed seem to be very good value. "We believe in a different approach to tablets—providing premium products at non-premium prices—and customers love it. In fact, we've seen Fire tablet sales more than double year-over-year as a result," said Kevin Keith, General Manager, Fire Tablets. "The all-new Fire HD 8 packs more battery life, more storage, faster performance, plus Alexa—all for less than $90." The new generation Amazon Fire HD 8 tablet is based upon an 8-inch widescreen (1280 x 800) HD IPS display. As mentioned above, there are many spec improvements in this refreshed model which offers up to 12 hours of battery life (from a 4,750mAh battery). 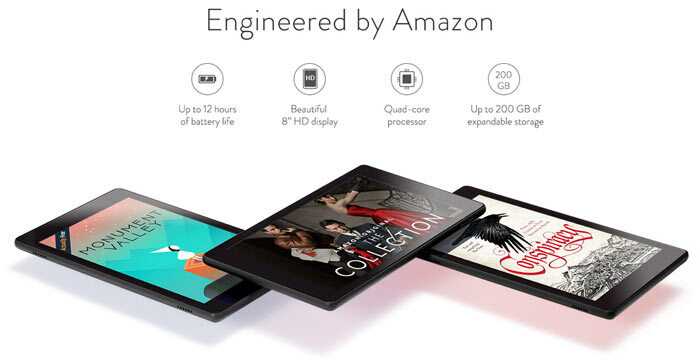 Amazon has installed a 1.3 GHz quad-core processor, with 1.5GB of RAM, to keep the system and apps running snappily. Built-in storage has been doubled, with the entry level now being a 16GB model (there'a also a 32GB option). Whichever Fire HD 8 you choose you can add more storage via the microSD card slot. 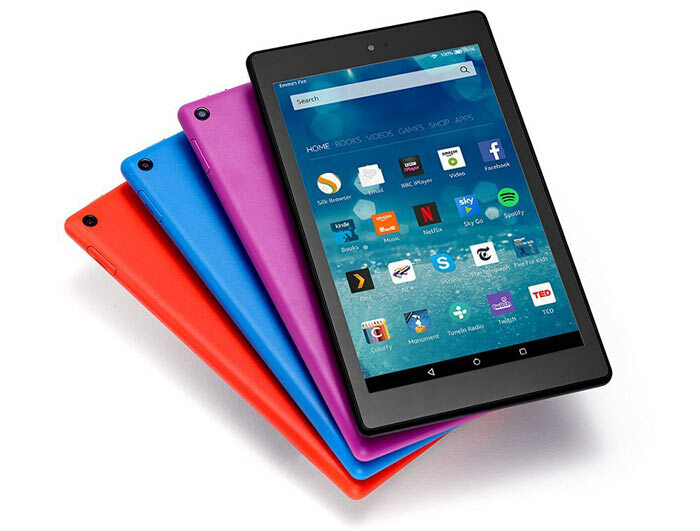 The Fire HD 8 tablet will ship with Fire OS 5 and be its first to support Alexa, Amazon's cloud-based voice service as leveraged by the Amazon Echo device. With a long press on the Home button users can ask to enjoy music, listen to audiobooks, ask questions, shop, find news, hear the weather, and more ("coming soon"). If you already have a Fire tablet please note that Alexa will be coming to last year’s Fire HD 8 tablets, the Fire HD 10, and standard Fire via a free over-the-air software update in the coming months. The updated Amazon Fire HD 8 tablet is available for pre-order immediately and will ship from 21st September. As mentioned above, in the UK the starting price is £89.99 for a 16GB model "with special offers" (lock screen and other ads). For a 32GB model its £109.99, and for either model it costs £10 more to have a system without special offer adverts. Which means: Market share isn't great so we're just throwing anything out there to see if it'll stick. Premium? 1280 x 800 cannot be called premium. £89.99 inc ads in the UK? Please tell me that you can disable the ads otherwise I'd never, ever, consider this tablet. £89.99 isn't a bad price though. As the SoC is alledgedly 64bit, does that mean it will get Fire version of Android 7 ? Does anyone know if there are likely to be any reviews before the official 21/9 release date, particularly with regard to ability to install Google Play Store, and screen clarity for reading eBooks ? cant see them open for google play store, and their own is to limited for me.